- Changed the All Programs font and settings cause some users had problems. - You will have to delete your old skin copy before install this new one. Shut Down panel, Please Wait panel, taskbar and more. iFlex main style but without the borders with drop shadow. 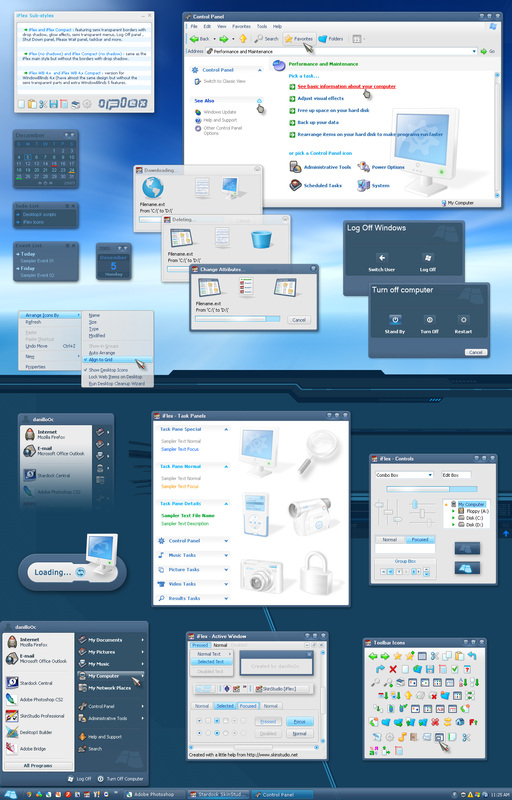 semi transparent parts and extra WindowBlinds 5 features. I hope you like the skin. What can I say danillo other than this is excellent. Thank you so much for sharing. Loving that blue! Great Job! Beautiful, some how, does not even come close to describe how perfect this is! Fantastic job. Very very nice!!!! Another reason why I purchased WB5 just yesterday. Where is the "worship" emotiocon? Where is the drool bucket also!!! First rate stuff. 5 stars indeed. As others have said this is just great. I find it very usable; it cooperates well with FireFox and my ObjectBars needed no tweaking after adopting the skin. The attention to detail, like having the title bar buttons of inactive windows respond to mouse over and subtle use of WB5 capabilities, is much appreciated. Top notch. Thank you for the early Christmas present, danilloOc! danilloOC, it was because of 5imple and dogma X that I finally purchased window blinds after using it for 3yrs. 5imple Alpha is my favorite and now you've done it again! Wow is all I can say. I anxiously await anything you release. Very well done danilloOC. Good choice of colors. I hope that is allowed, if not, my appologies in advance.